I'm really enjoying knitting Anatolia. It's been a while since I worked on a challenging project like this one and I feel like I'm back where I belong - in the land of a multiple colors, lots of ends, tiny boxes on a chart with little Xs and Os and working with wonderful yarn. So far there have been quite a few three-color rows and I know that there will be some four-color rows coming up before long. Bring it on! 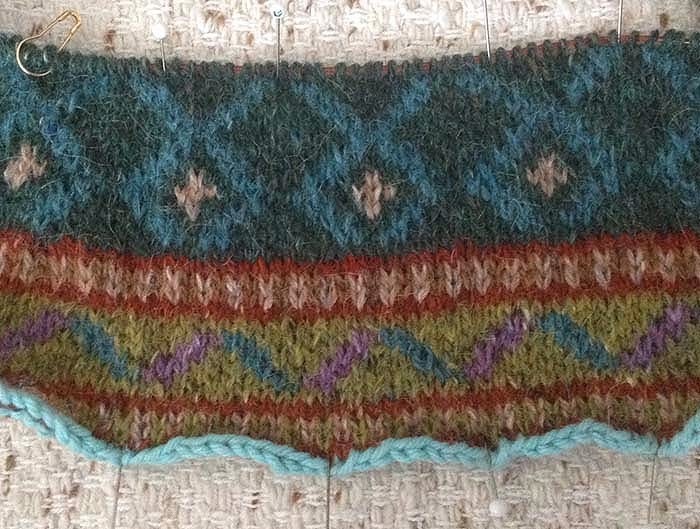 In order to add length to the sweater I started by working a couple of the patterned panels from the yoke (pictured below). Now that that's done I'm following the body pattern as written. If you look at the yarn in the ball, Rowan Felted Tweed DK, you might assume that it's scratchy, but it's not. It's 50% wool, 25% alpaca and 25% viscose, and very kind to the hands. I like the way it feels very much. Rowan is known for discontinuing yarns with regularity but I hope that this one stays around for a while. I can see myself knitting with it again and again. As a matter of fact, the Jubilee Throw is knit with this yarn, too. I found these little markers when I was on the Yarn Along the Rockies yarn crawl last September. They remind me of shower curtain rings. They are excellent as markers or as pins. Here I'm using one on the needle to mark the end of the round, but I've also used it to pin on my knitted fabric to remind me which is the right side. I've got lots of markers in my gadget bag but so far, these are my favorites. They are tiny, sharp when opened and practical.